Hello! 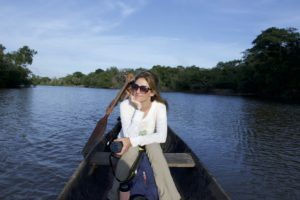 My name is Christina Ward – I am an artist and conservationist dedicated to preserving the wildlife of Guyana and enriching the lives of the country’s native people. In collaboration with colleagues from Surama Eco-Village, Creature Conserve, a registered 501c3 and my personal business: Colors for Conservation, we are launching the “Save the Giants” conservation initiative. 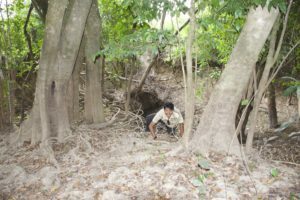 “Save the Giants” will expand upon the giant otter surveys currently being conducted by local Makushi surveyors, Kenneth Butler (Surama) and Oswin Ambrose (Massara), along the Rupununi River in Region 9 of the Guyanese interior. 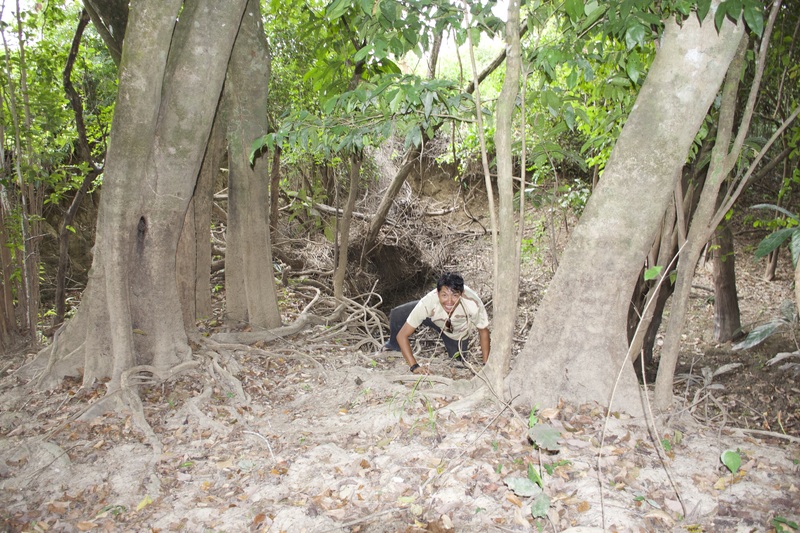 Please visit our “Blog” pages for more information on the current field surveys. 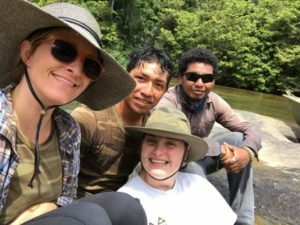 Bridgette San Marco is a biologist, conservationist, behavioralist and giant otter enthusiast, who has worked with a wide range of different taxa in zoological facilities for over fifteen years. In addition to her work with Save The Giants, Bridgette is a giant otter biologist at a zoological facility. With several years experience in otter biology and husbandry, Bridgette uses this information to help with the scientific research of the species but also in sharing that knowledge with others to inspire a love of otters as far and wide as possible. Dedicated to help conserve wild giant otters and their habitats, Bridgette joined the Save The Giants team in hopes to help research and protect possibly the last stronghold for giant otters, the beautiful landscapes of Guyana. 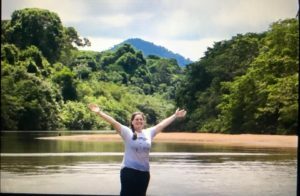 Bridgette does her best to educate people around the world about this amazing species and what they can do to help protect them. Globally we all need to be more cognizant of how our actions effect the environment around us. People mine for natural resources all over the world, by doing your part in your own backyards you'll be helping species worldwide. Bridgette has a B.S. in Marine Biology from the Florida Institute of Technology. Oswin Ambrose, “Oz,” a Macushi Amerindians native of Yupakari Village, serves as Save the Giant’s head field researcher. Growing up in Yupakari, a land sandwiched between the Kanuku and Pakaraima mountain ranges, in the midst of the Essequibo and Amazon basins, Oswin was immersed in the all of the rich biodiversity that Guyana has to offer. From a young age, Oz enjoyed spending time on the river, bird watching and of course, looking for giant otters. As an experienced naturalist and boat captain, Oz has an uncanny ability to locate and identify the many species of birds, amphibians and mammals that inhabit this region…especially giant otters! 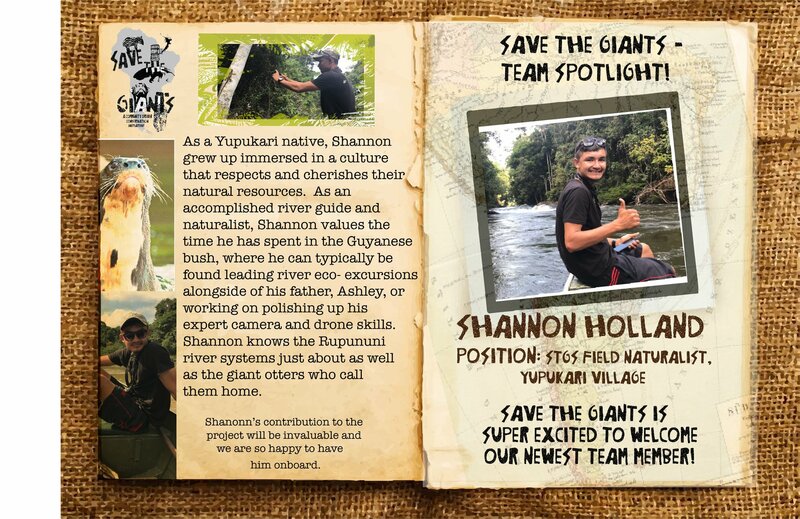 Oswin, with his expertise in the field, his giant otter locating “6th sense” and his winsome sense of humor, which is guaranteed to lift spirits, is an invaluable part of the Save the Giants team. When Oz is not leading guided tours or tracking otters, he enjoys drawing, playing football and assisting his sister in her work as a nurse at the local Lethem Hospital.